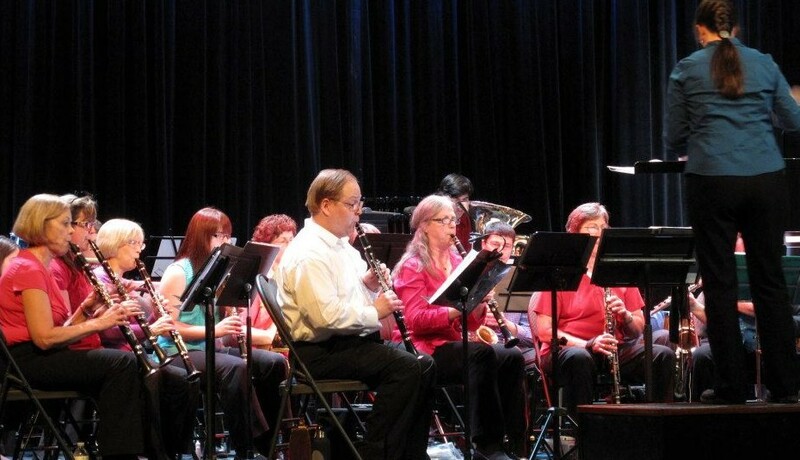 The No Strings band offers the opportunity for local amateur wind musicians in Sudbury of all ages, "from high school students to retirees," to perform in a full concert band ensemble. We offer a unique performance perspective to the Sudbury arts community, due to our novel repertoire and mandate. The NSACB is also a non-profit community organization which is sanctioned and supported by the City of Greater Sudbury (through an annual cultural grant) as well as through past grants with the Ontario Trillium Foundation and the Sudbury Community Foundation. In 2013, we became members of The Canadian Band Association (CBA). Part of the band's mission is to promote concert band music locally as well as to educate the public about wind instruments. Our band performs free-of-charge (or sometimes via donations at the door) at locations throughout Sudbury, from September to mid-June. Our venues each season can include schools, libraries, parks, seniors' residences, etc. Our repertoire includes a diverse selection...ranging from Gustav Holst to a Disney medley, and just about everything in between! In the past, our band has frequently supported and partnered with various community groups to promote worthy local causes. Such local nonprofits which we have supported in the past, would include: the Elgin St. Mission; the Rockhaven Recovery Home for Men; Sudbury Food Bank; Northern Ontario Families of Children with Cancer, the Samaritan Centre, Genevra House, Easter Seals, the Military Families Fund, the Sudbury Action Centre for Youth, etc. ​Occasionally we have held “joint concerts” with other local musical groups whom we’ve supported, such as high school bands. Our band has also in the past encouraged smaller ensembles within the group to form (e.g., quartets, etc.). These groups will sometimes perform in their own concerts, as well as occasionally on the same venue with the larger band. The No Strings Attached band gives local brass, woodwind and percussion players the opportunity to get together and make music in a fun and accepting atmosphere. Our group attempts to improve the skill levels of its less-experienced players through an active program of mentorship. Our members can range anywhere in age from about 15 to 85. Some of our players had never played their instruments for decades before joining our band, whereas others may perform regularly in their high school bands. Some of our high school students joined us because they were looking for a musical environment that was more challenging than that provided by their own high school ensembles. Other members joined us because they wanted to remain active in music but couldn't find a band to play in after high school. This would include, for example, some college and university students as well as members from the general public who simply enjoy playing music. We like to think that our membership is just as diverse as the people who make up our community! 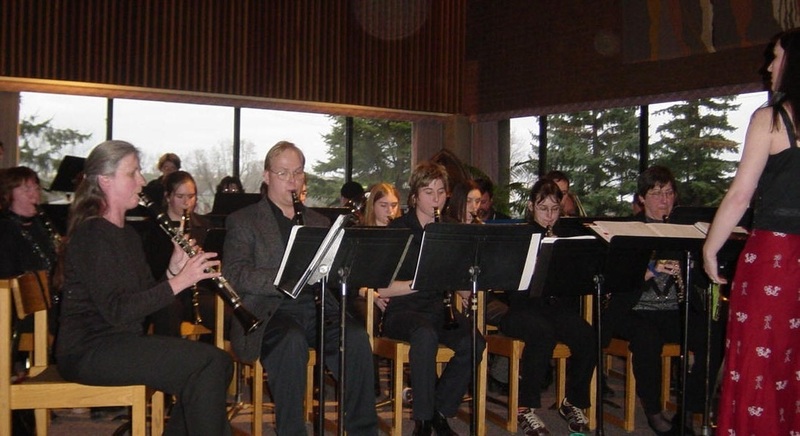 Previous attempts over the years to establish a permanent civic band in Sudbury have met with mixed results (one notable success story during the post-war period was the "Sudbury Legion and Citizens Band," which flourished in the 1950's). A surprisingly large number of municipal bands over the years have managed to represent the various towns surrounding Sudbury; including Coniston, Copper Cliff, etc. Our band originally got its start as a Laurentian University - ﻿Huntington College﻿ thesis project on the part of our conductor in the Fall of 2000 (around this same time, the name “No Strings Attached,” was first suggested by one of our Huntington students in the band, & the name stuck). The first rehearsal was held on September 27th, 2000 at Lo-Ellen Park Secondary School. Our first concert took place on January 29th, 2001 at Huntington College. In some of our earlier seasons, our rehearsals were held at the Jarrett Centre or at Churchill Public School. However, since the Fall of 2004, we have been situated more-or-less permanently at Lo-Ellen. In 2003, the band became a federally-registered non-profit charitable organization (Reg. No. 88643 4802 RR0001). In June of that same year this website was launched, (and was redesigned in 2015). The band also currently has a page on the social networking site Facebook. In 2004, the NSACB received a generous grant from the Ontario Trillium Foundation to help purchase percussion equipment. Also in 2004, the NSACB awarded its first bursary to a deserving local music student. In 2005, '10, ‘14, ‘16, ‘17 and 18 our band participated in annual Northern Ontario Music Festival (NOMFest). In 2008, the band received grants from the City of Greater Sudbury and the local chapter of the IODE to assist in its purchase of a new trailer (which is stored courtesy of Jim’s Automotive). As a tax exempt charitable organization, we also gladly accept donations from various sources (in the past, our printing needs for concert programs etc. have often been supplied at low cost by Duplicators). In it's early years, the NSACB typically numbered as few as 12-15 members. Currently however, there around 20-25 musicians in the group, and the band’s repertoire has become more challenging over the years as well. The band's conductor and musical director from its inception, has usually been Sandra McMillan. During Sandra's occasional absences, her role had been filled in by various "guest" conductors; including Matt Beatty (2010), Dave Wilks, Erin Morel, Jack Broumpton, David Young (2013-15), Linda Berger, Peter Scherzinger and Marc Taillefer, among others. During the 2013-15 seasons, Sandra had been taking a Sabbatical from her conducting duties, and her role as Musical Director of No Strings was capably handled by local music educator and percussionist, David Young...Sandra is thrilled to be back as our Conductor!